During my 100hikes project, I was fortunate enough to visit the Vetter Mountain Lookout before the Station Fire took it from us. While there, I got a tour of the small 14×14-foot building and the tools the volunteers use to help spot forest fires. Along with the Osbourne Fire Finder and a large topographic map under glass to mark lightning strikes, the fire lookout had an atlas to the Angeles National Forest. I had never seen or even heard of one of these map books before. The moment I saw it, I knew I had to have one. When I got home, I searched online for one to purchase, but struck out. Nothing on Alibris, eBay, or Amazon. I would learn that the atlas was printed once in 2005 and had been sold out. I gave up my search, hoping one day it would be printed again. 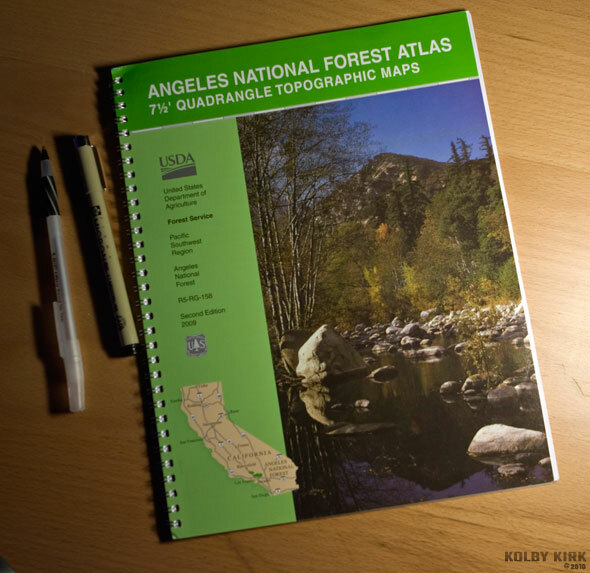 Last December, the USDA published a second edition of the Angeles National Forest Atlas. Within two days of finding it for sale, I had a copy in my hands. The spiral-bound atlas measures 8 1/2 by 11 inches. 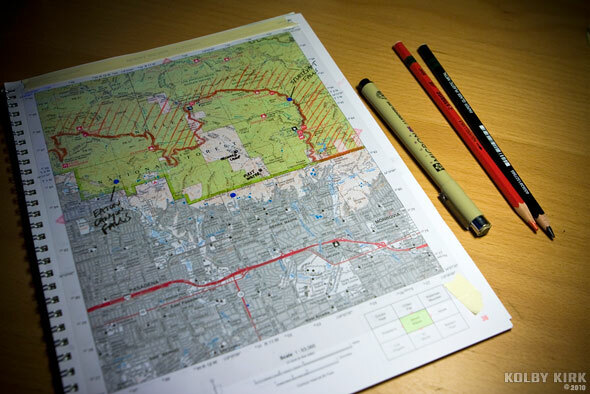 It’s just 48 pages, but is jam-packed with great information, including a detailed map legend in both English and Spanish, information on traveling on National Forest roads, a map index, advice on keeping your trip safe, and a list of Angeles National Forest contacts. Of course, a good portion of the book consists of maps. Forty of them in total, all at a scale of 1:63,360 – enough detail to plan a trip into the mountains but probably not detailed enough to use while hiking. It retails for $18.00. I’m one who loves to write in books and on maps with notes, but I didn’t want to permanently mark up this atlas. A quick trip to the art store solved this problem. I bought a book of clear overlay film (brand: Grafix Dura-Lar), a handful of pencils that can write on glass (Stabilo Aquarellable), and a roll of drafting tape. I cut the film to size and taped it into the atlas. Now I’m able to make alterations to the atlas without damaging the book. 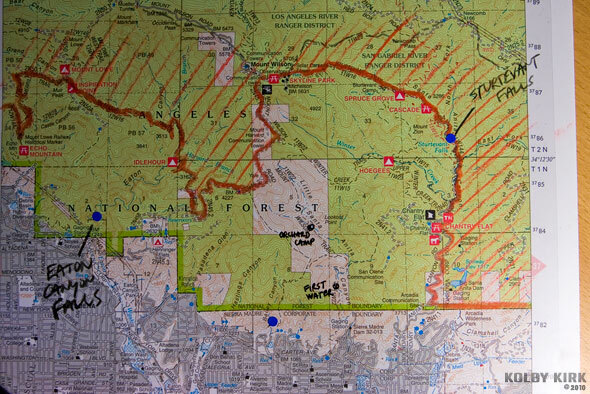 I’ve already added hiking location names (like Orchard Camp along the Mount Wilson Trail), waterfalls, and the Station Fire closure area. The pencil marks come off easily so for places that I plan on keeping on the overlay, I use an archival ink pen (Sakura Pigma Micron 05) which has a fine tip for adding small details and lines. The Mount Wilson quadrant with overlay. A close-up of the Mount Wilson quadrant with overlay mark-ups. Pull back the film and voilà! No More markings! 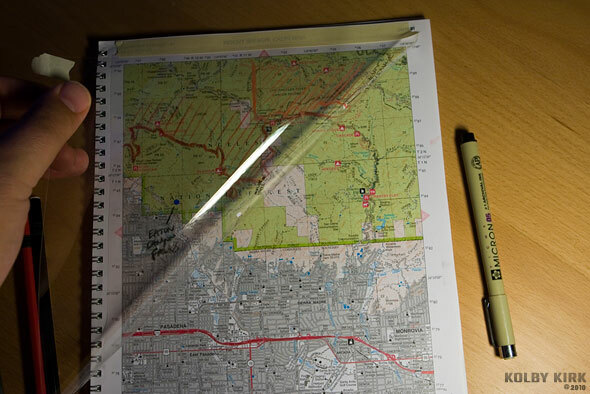 Along with picking up the Angles National Forest Atlas, I purchased a few others as well. The hefty Inyo National Forest Atlas (2008) has 115 maps covering some of the greatest hiking locations in the US. Similar to how a map of Hawaii is bound to show portions of the ocean, the Inyo NF Atlas also includes bits of neighboring areas that border the National Forests, including Yosemite National Park, Sequoia & Kings Canyon National Park and Death Valley National Park. The Los Padres National Forest Atlas (July 2003) is different from the others in that the right page shows the topo map while the left page shows a satellite image of the same area. It sells for $38 and has over 200 pages and 103 maps. 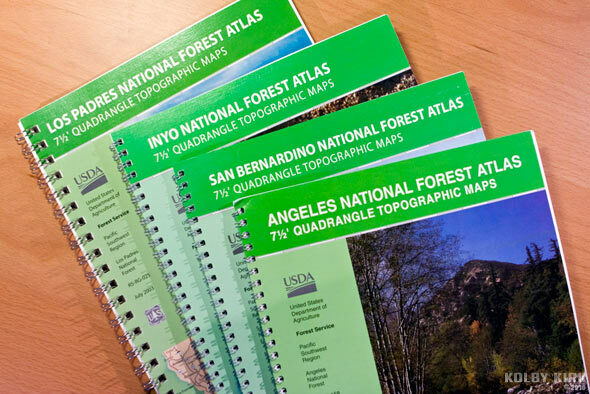 You can purchase these atlases, as well as other maps and atlases from across the country, at the National Forest Store.